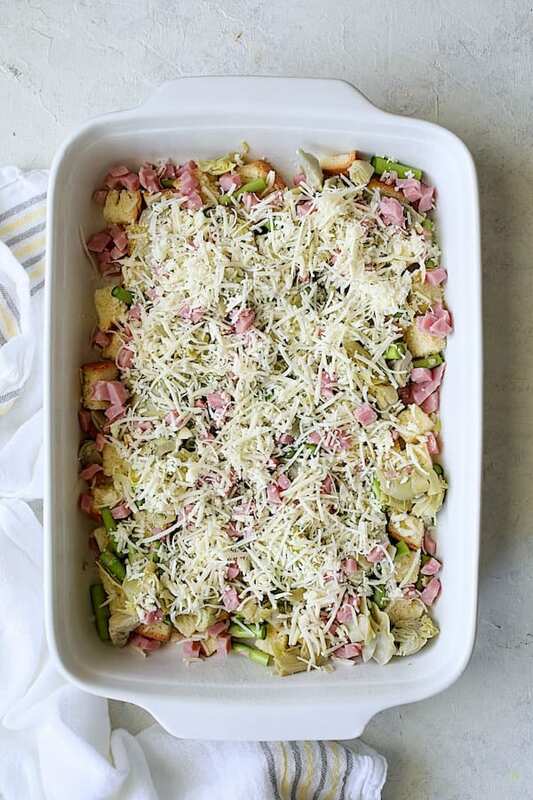 Breakfast Strata with Asparagus, Artichokes, Ham and Gruyere is the perfect French-inspired spring special occasion treat for family and friends and it’s super easy! With Easter fast approaching, you’re probably starting to think about what to feed family and friends. Oh, sure, there are always the dishes that are family favorites and that everyone looks forward to having; Easter is no different than Thanksgiving and Christmas in that regard. However, if you’re like me, you like to mix things up! 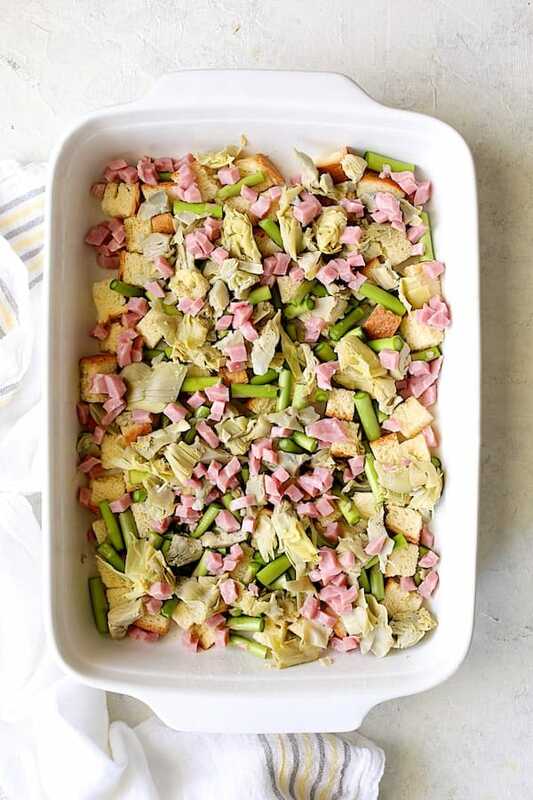 If your family loves a good breakfast casserole on Easter morning, how about this French-inspired Breakfast Strata with Asparagus, Artichokes, Ham and Gruyere? It’s super impressive yet super easy! Now, not gonna lie. This breakfast strata is a little more over-the-top than your typical sausage, egg and hash brown breakfast casserole. This breakfast strata pushes the limit to something more luxurious. 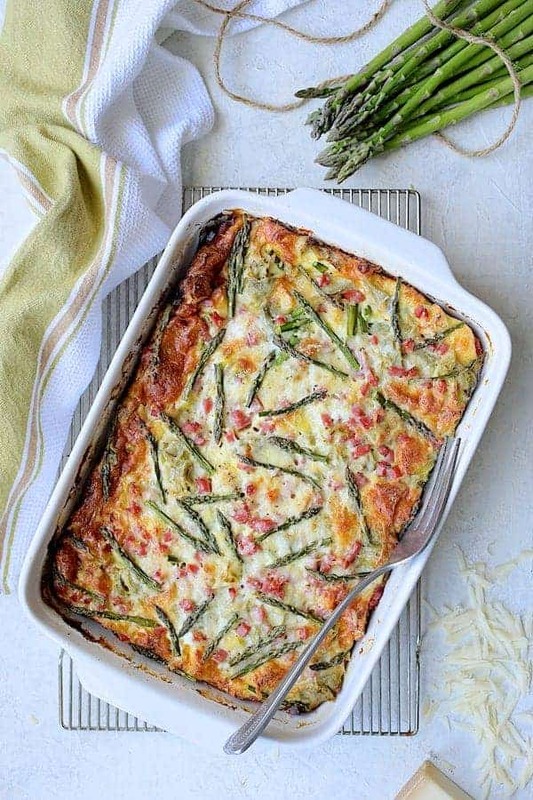 If you want to impress some out-of-town guests or simply do something super-special this Easter, this Breakfast Strata with Asparagus, Artichokes, Ham and Gruyere is how you do it! Start with cubed brioche bread. Bake them for about 10 minutes to lightly toast and dry them out. 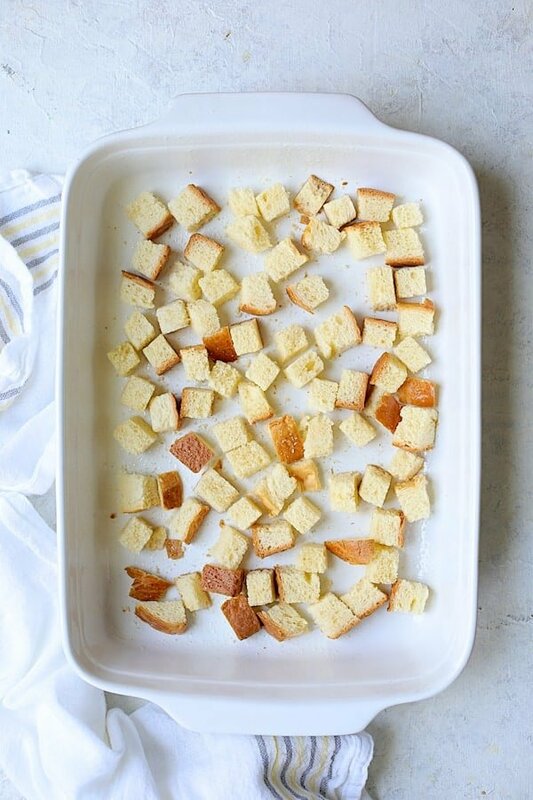 Place half the brioche cubes in the bottom of a prepared baking dish. 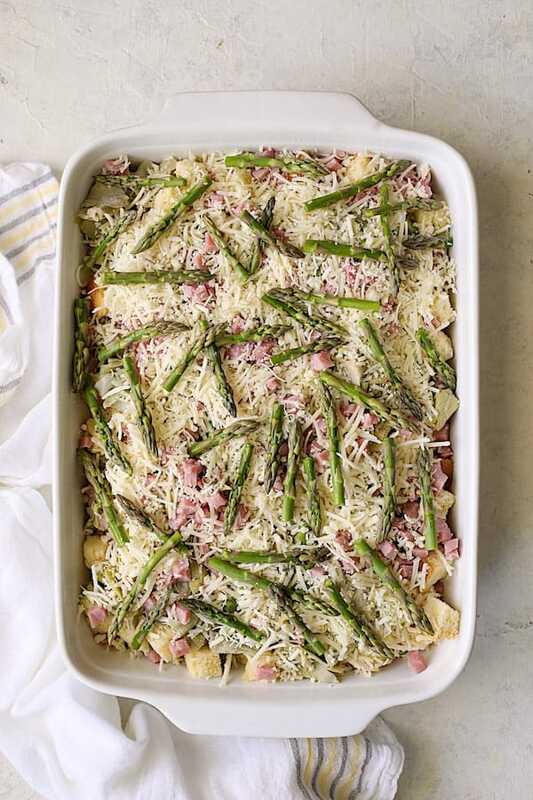 Layer about a third of the asparagus (reserving tips for the very end), half the artichokes and half the ham in the baking dish. 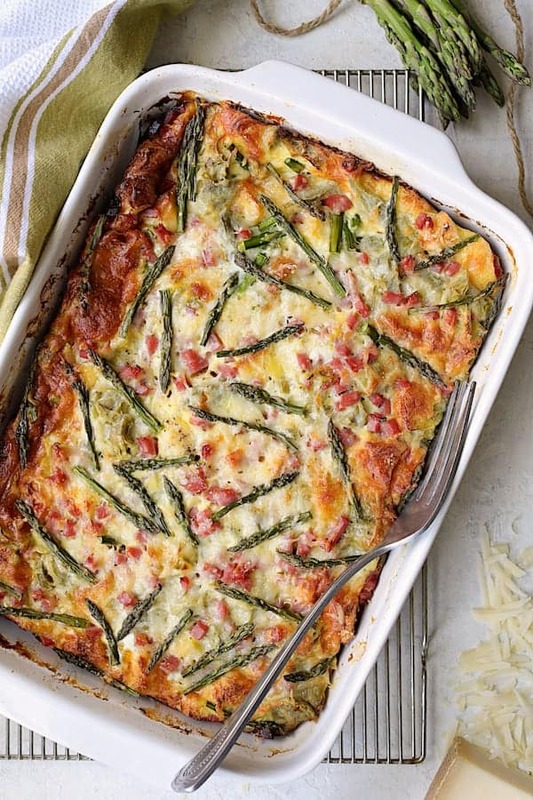 No need to precook the asparagus–it will soften up as the strata bakes. 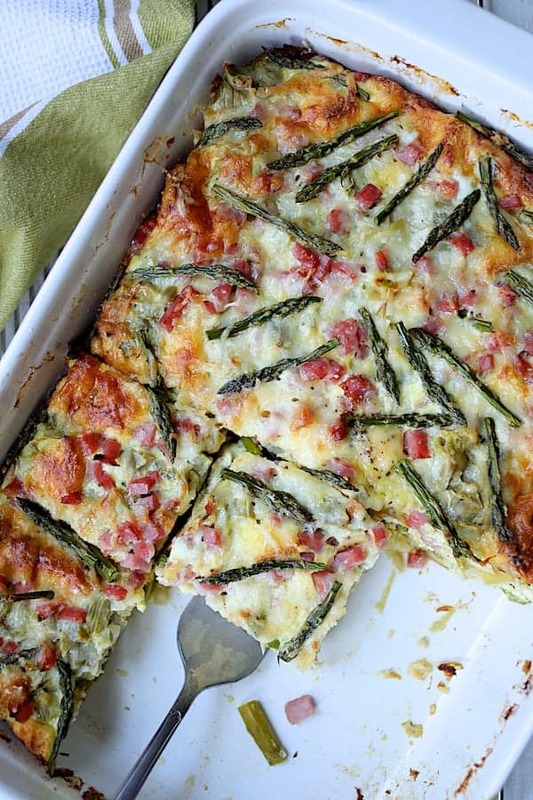 Repeat the layers with bread, more of the asparagus, the remaining artichokes, ham…. … And the remaining cheese and finally the asparagus tips for the top. 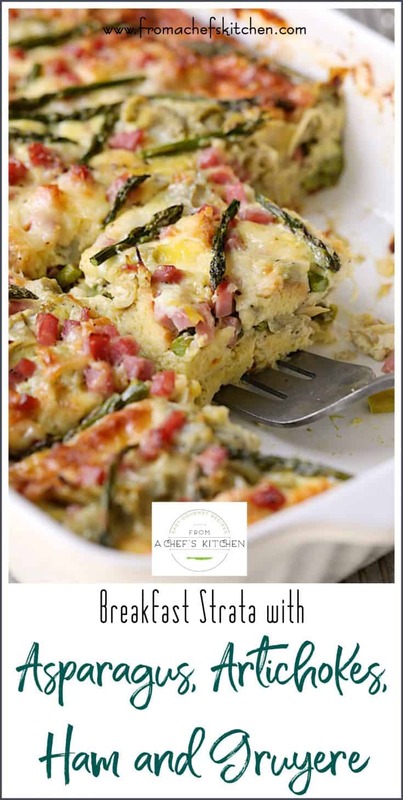 Bake the breakfast strata…. and baby!!! Golden, puffy egg deliciousness around the edges! 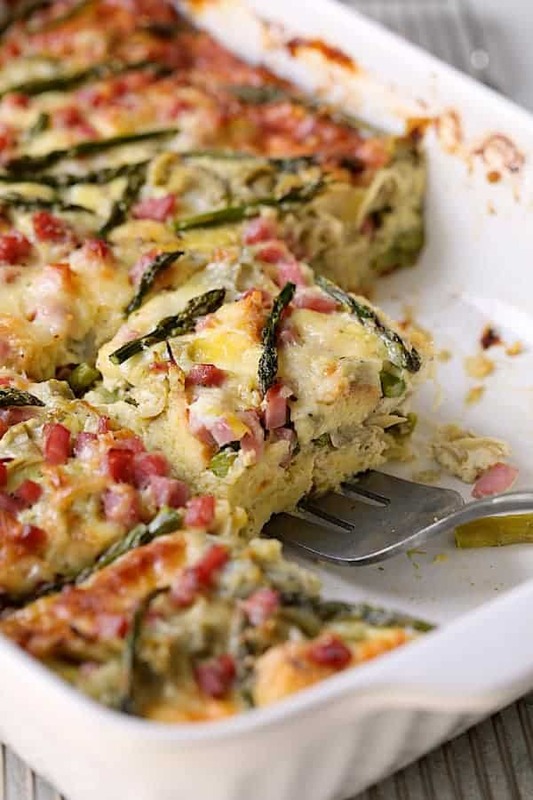 Breakfast Strata with Asparagus, Artichokes, Ham and Gruyere for the Easter morning win! Now, a couple of notes about the ingredients. Brioche can be pricey but good quality, buttery white bread or country-style makes a great substitute. Also, Gruyere can be on the pricey side. Grand Cru is about half the price and is a great substitute for Gruyere. Regular Swiss cheese or Gouda would also work well. 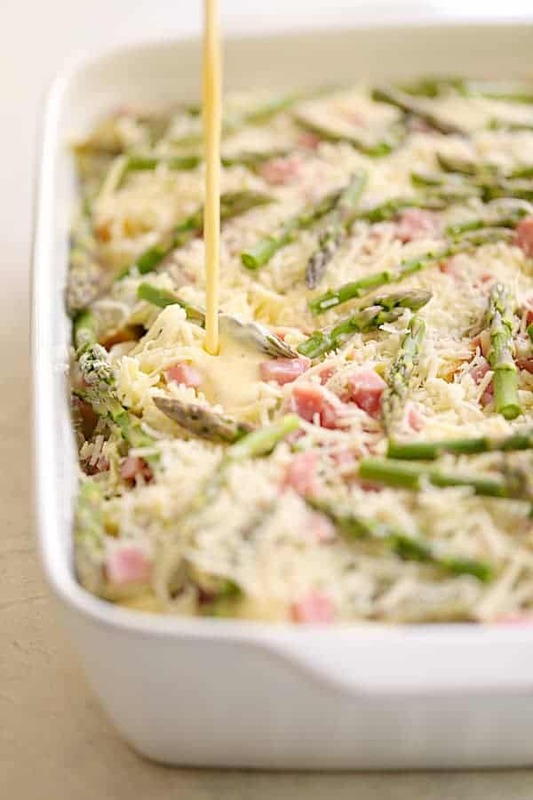 Breakfast Strata with Asparagus, Artichokes, Ham and Gruyere is the perfect French-inspired spring special occasion treat for family and friends and it's super easy! Preheat oven to 325 degrees. Spray a 13 x 9-inch baking pan with cooking spray. Place cubed brioche bread on a baking sheet and bake 10 minutes to lightly toast. 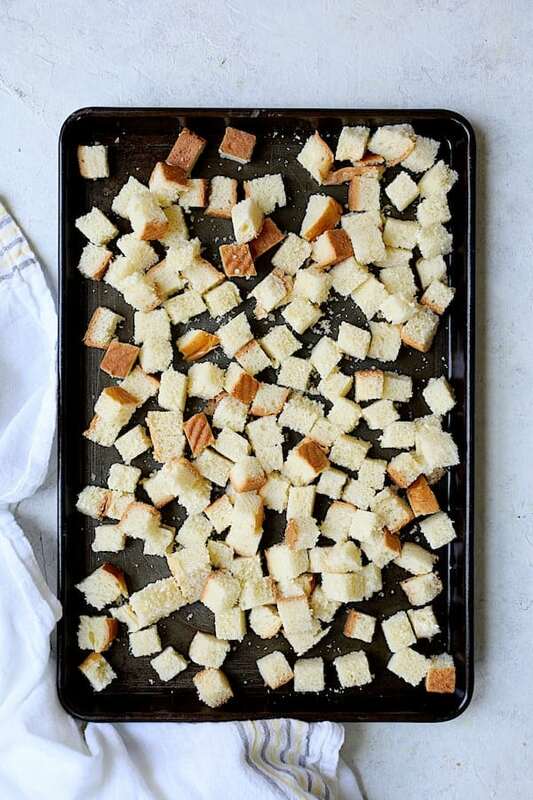 Place half the brioche bread cubes in the prepared baking pan. Scatter approximately 1/3 of the asparagus stems over the bread (reserve tips for the top). Scatter half the coarsely chopped artichoke hearts over the bread and asparagus. 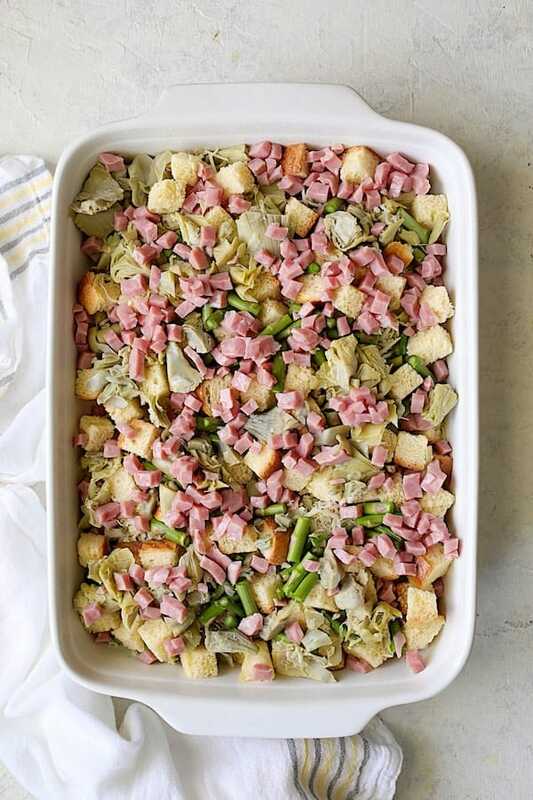 Scatter half the diced ham over the bread, asparagus and artichokes. Repeat layers with remaining bread cubes, asparagus stems, artichoke hearts and ham followed by the rest of the cheese. Scatter asparagus tips over the top. Whisk eggs and milk or half-and-half together in a bowl until well blended along with salt and black pepper. Bake 1 hour or until puffed and golden around the outside. Let rest 5-10 minutes. Cut into squares and serve. MAKE AHEAD: After pouring custard over the layers, cover with plastic wrap and refrigerate. Let stand at room temperature while oven preheats. I am all about a luxurious breakfast strata! This sounds just incredible. Love the brioche and asparagus! Thanks, Danielle! Hope you enjoy! Fantastic recipe, we made this for Sunday Supper with a tossed salad for the side dish. I cut the recipe in half as there are only two of us and baked it in a glass pyrex about the half the size of 9×13 dish. It’s perfectly light (we both had seconds) and a great breakfast for dinner vibe! Just heated the leftovers for lunch in a double boiler with a few drops of water in the top pan. Worked perfectly maintained the just baked custardy texture we all love! 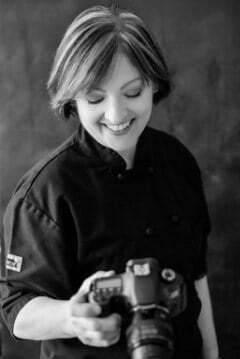 Thanx Carol for another winner no-tweaks needed recipe! Thanks, Jim! I’m loving the idea of this as breakfast for dinner! My readers will appreciate knowing they can cut this recipe in half or divide up. Thanks again!